Adding Rare Items Every Day! We’re now leaving our first week of Cataclysm behind but in doing so we have many good Archaeology finds to share! Expect much more content pertaining to rare Artifacts as the 2nd week progresses. 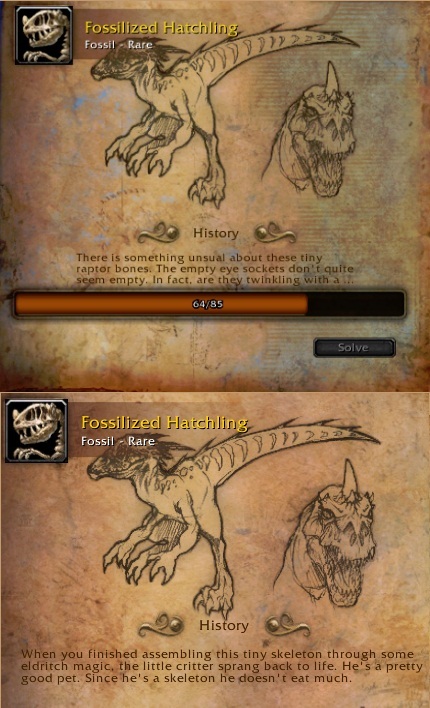 Finished up the research project below for the rare pet. When you finished assembling this tiny skeleton through some eldritch magic, the little critter sprang back to life. He’s a pretty good pet. Since he’s a skeleton he doesn’t eat much.